Imagine awakening every morning to the soothing sea breeze as your bedroom curtains billow in the warm wind, welcoming you to a new day within your Park Shore villa. This is paradise…or, perhaps the closest a few select individuals will ever come to finding their exceptional place to call home under the Naples, Florida sun. 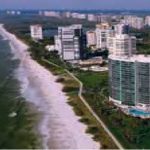 With just a short drive to downtown Naples, the Park Shore community ranks as one of the most esteemed neighborhoods in the world and continues to make an eloquent statement of well-designed luxury residences. The Park Shore area offers residents a diversity of activities, amenities and facilities, enhancing the upscale lifestyle of those who choose to plant their roots and call this area home sweet home. Park Shore villas real estate is not only diverse, but eclectic…located in a distinctive neighborhood offering chic housing, five-star resort accommodations, excellent schools, hospitals and medical facilities; fondly embraced between the pristine white beaches of The Gulf of Mexico and the waterways of Venetian Bay. Enjoy well-maintained sandy beaches, water sports, fine dining, cultural, arts and music events at the home of the Naples Philharmonic and The Baker Museum – Artis Naples and shopping and dining at the Village at Venetian Bay and the Waterside Shops. The development of Park Shore real estate began in the early 1960’s and 1970’s and was originally platted by the Lutgert Companies. The combination of elaborate tropical landscaping and views of the beach, The Gulf of Mexico and Venetian Bay make Park Shore a lush trend-setting area with all walks of life…retirees, couples, singles and families. Park Shore villas for sale are ascending once again, enticing the most distinguished and well informed buyers to explore and venture into the magnificent world of these stunning one-of-a-kind residences. As a destination known for its dramatic coastal and bayside views, the neighborhood of Park Shore offers a touch of luxury with several villa locations for your consideration. 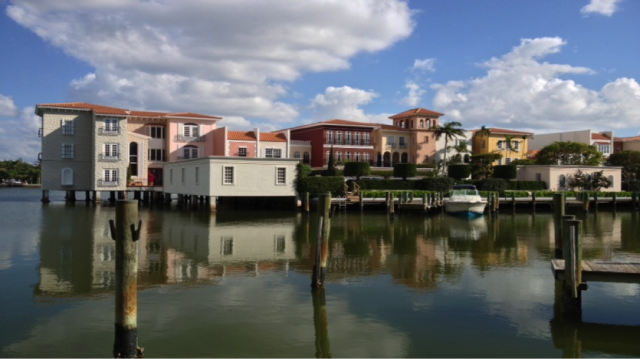 The Quadrille Villas at Park Shore is a grouping of six individual villa homes, and is located directly on Venetian Bay. These magnificent villas have private docks, gated courtyards, lush trellis gardens, a private pool and flowing fountains, all reminiscent of a European life. Direct access to the gulf is available via Doctors Pass. Casa Mar Villas at Park Shore is a magnificent community of twelve exquisite attached villas, positioned on the Gulf of Mexico and steps from fine shopping and superb dining at The Village at Venetian Bay. Each individual villa has a two car garage and two additional parking spaces. Boat slips may be leased or purchased from The Venetian Bay Yacht Club, and residents enjoy access to the private Park Shore Beach. Park Shore Venetian Bay Villas are a fabulous sight to behold, a gated community built upon a man-made island…expressing a true aura of decadence and comfort as if living in Venice, Italy. 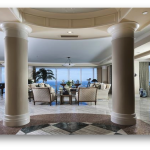 Positioned directly on the beautiful shores of Venetian Bay, there are 32 luxurious two and three story residences, built directly over the water on wooden pilings. The individual villas are unique with a stunning bayside pool, individual manicured gardens, Italian marble fountains, classical architectural features and archways, colonnades and private docks providing direct access to the Gulf of Mexico and residents have access to the private Park Shore Beach. Tropics at Park Shore is a low rise waterfront, gated villa community, poised serenely on Venetian Bay with three buildings and a total of 33 charming individual residences. Boat slips are available for lease or sale at The Venetian Bay Yacht Club with direct access to the Gulf of Mexico via Doctors Pass. All residents have access to the private Park Shore Beach. Ardissone at Park Shore consists of six buildings with three levels…a gorgeous gated villa community built on a private island with a total of 33 one and two story residences. The Mediterranean architecture and style enhance the lavish landscaping and pristine views of Venetian Bay. Residents have access to the private Park Shore Beach. Depending on availability, boat docks may be leased or purchased and there is direct access to The Gulf of Mexico via Doctors Pass. Hidden Lakes Villas at Park Shore was built in 1984 and is located on Belair Lane. A low rise villa community, it consists of eight building with each having three levels. Amenities include parking, a splendid outdoor pool, attractive landscaped gardens and access to the private Park Shore Beach. Venetian Cove Club Villas at Park Shore, a mid-rise residential community with a total of 60 units was built in 1977 and is located at the most southern point of Venetian Bay. Located directly across the street from the private Park Shore Beach, residents have access to the beach and facilities. Amenities also include parking, resident boat docks and a lovely swimming pool. Villa Mare Villas at Park Shore is a unique gated villa community that is positioned directly on the Gulf of Mexico, consisting of 28 individual villas and was built between 1984 and 1989. Each villa has a two car garage, and amenities include a modern pool, beautiful tropical landscaping and access to boat slips at Venetian Bay Yacht Club. Villas of Park Shore is located on a scenic lake and consists of two and three bedroom residences. Amenities include an inviting swimming pool, resident parking and access to the private Park Shore Beach. With all of these magnificent villa communities, Park Shore villas for sale will continue to bring that perfect touch of luxury to you and your family under the Naples sun. 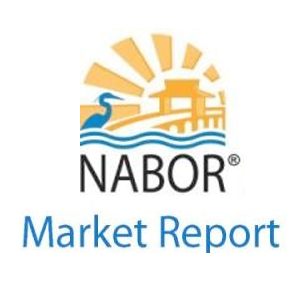 Please contact Corey Cabral at Naples Luxury Realty Group to schedule a private viewing and for all of your real estate needs… 239-963-6590 or ccsellsnaples@gmail.com . Providing outstanding service above and beyond expectation, Corey will customize your real estate experience to perfection.